Take a bowl. Add wheat flour, sesame seeds, finely chopped mint leaves, black pepper, salt, oil, mix it well and knead dough. Make big 5 balls from dough. Roll it about 7-8 inch diameter. Cut into 4 parts. Take non-stick tawa/griddle and cook it on both the sides smearing with oil. You can select your shape. 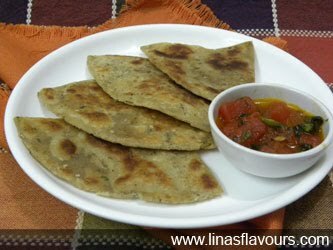 Serve it immediately with watermelon or any chutney.